With the Apple Watch on schedule to ship in April and some developers asked to have apps readied for this month, we are beginning to see a slow trickle of apps surface for the wrist-worn device. 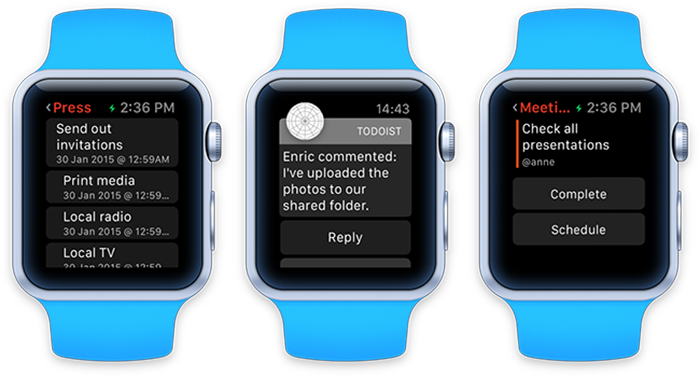 Todoist on Monday became the latest software maker to tease their work-in-progress Apple Watch app, sharing a video and screenshots of the upcoming to-do app with MacRumors this morning. Todoist [Direct Link] aims to bring its popular to-do app for iPhone and iPad to the wrist with a simple Apple Watch app that will provide task management at a glance. When paired with an iPhone, the app will enable users to view their upcoming tasks and categories, reply to comments, and schedule or mark complete tasks. Todoist tells us that the video below is missing the task filter view, but plans to add the feature soon. Once inside the main Todoist app, the user can access their Inbox, Projects (and full task lists within each project), Labels, Filters, and a 'Today' view showing all tasks for the day, as well as overdue tasks. When you tap on a task to get the detailed view, you will be able to see the task's associated labels, its due date, its priority level, and you will be able to either "complete" or "postpone" the task directly from the watch. If you don't want to complete or postpone the task, you use the watch's microphone to explicitly assign a time/date to the task (this feature is still in development)." Apple made its WatchKit SDK available alongside the release of iOS 8.2 and Xcode 6.2 beta in November, although developers are limited to an emulator-only development environment until the Apple Watch is released. For now, a third-party Tesla app and concepts of what apps such as Instagram and Uber could look like provide the best teaser of what the future of the wrist holds. Finally To-Do lists on my wrist! More solutions to problems I don't have. I don't want an Apple Watch. I'll wait till second gen. I want full-blooded apps, not ports to my iPhone apps. The Apple Watch is ugly. I think that covers it, let me know if there's anything I missed! The more I see of this device, the less I want it. Does it come with a magnifying glass to read it? "I can't wait for an Apple Watch." "I'll be first in line" (to evolve into) "shut up and take my money"
...and then 100 odd or rare use cases where we conjure up some situation where it would be somewhat-to-tangibly easier to peek at a wristwatch screen rather than pull the iPhone out of our pockets (that must be in close proximity to the watch). I saw one the other day about a guy being "all bundled up for a big winter storm" so he was rationalizing the utility of being able to look at the watch so it could help him make the decision on if he needs to dig the phone out of the inner layers of clothing. :rolleyes: Might as well be: "if I was in space and the iPhone was inside the space suit but I had managed to strap the watch around the outside, it could be a LIFE SAVER if I needed to get a NASA notification right then (and all other communication systems of the space suit had failed)." At least in one like that we can spin how it can save a life instead of getting "what R U doin?" messages to us a few seconds faster than a vibrating iPhone->read the text process. The "convenience" argument is hilarious as "we" were generally quick and passionate about pounding a concept like Google Glass though something like that could bring notifications & todo lists to our "can't dig out my iPhone" or "can't afford the valuable seconds lost to digging out my iPhone vs. checking a watch face" scenarios without having to even move our arms or head at all. Personally, I'm still looking for something beyond "added convenience" and "time savings" vs. just using the bigger-screen, more functional device already on hand (and probably in your hand 100 times a day). These weird use cases "we" are offering in trying to rationalize it show the lengths even we (a very pro-Apple crowd in general) are having to stretch to try to make it make sense. If Google Glass had been Apple Glass, I wonder it we would be spinning: "suppose I was armless" or "suppose my arms were tied"... "but I needed to get my notifications or todos anyway." Now step that trying-to-rationalize-it challenge out to the much less "Apple is God" masses. Why are those masses going to pay at least $350 for it? (because they- not us- make brand new Apple products a "next big thing" hit... or miss). It's an app extension, get it right! :). Apps won't be coming until the full blown SDK comes out - aka later 2015. I know, right!? I'm on an Apple products forum and welcome critical feedback, but you'd think I was on Android Central with the vitriol in some of these posts. I'm looking forward to the Apple Watch and a ToDo List app or app extension is the number 1 thing I need to keep my day on track. I really don't want to see such simple ports of iPhone apps. I want to see the iWatch used for more time-based things. iWatch apps should focus on changing their behavior based on the time or your current location, not just behaving like simplified iPhone apps..
Clearly developers don't get the idea of keeping the watch simple... they just want to cram the entire app on it and that is entirely the wrong approach. Apple needs to audit these apps and make sure they aren't trying to do too much in my opinion. The interface just isn't sized for it as well as the battery life. They really need to learn to K.I.S.S (Keep It Simple Stupid). The whole point is that in certain situations, you can glance at your wrist without taking out your phone. It's really an accessory to the iPhone, not a standalone device. It's not like people will buy an Apple Watch and throw their iPhone out. But a very expensive accessory. At the $350+ price point, it's only going to appeal to a very limited group of iPhone owners. I think it's very telling that Pebble just sold their millionth watch. That's not very encouraging. Once Apple blows through the fanboys and gadget freaks, who is going to buy this thing?